Hey guys! My name is Sydney and I am a sophomore studying neuroscience. 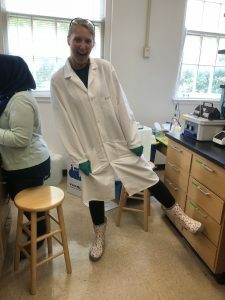 I picked DIY Diagnostics because my FIG professor recommended Dr. Riedel for being very open to letting students pursue their own interests, I knew that the lab is related to healthcare in some aspects, and it is interdisciplinary with biology, chemistry, and computer science. These points couldn’t describe the stream more perfectly. To give some context to my experience I want to explain the general lifecycle of being in FRI; In the spring you are placed in a lab and your research is driven by assignments designed to teach you various lab processes. In our lab, we learned qPCR, 3D printing, and even a bit of coding. We cultured samples of Waller Creek to detect a pollution source coming out of a pipe, and from that data alerted UHS and the city about a real public health problem. After your first semester you have the option to apply for a paid summer fellowship, which gives you a head start on the more independent project that you wouldn’t start working on until the fall of your sophomore year otherwise. For my project I chose to use wax-printing and a method of agglutination with CRP antibodies on paper-based diagnostics to detect a sample’s quantity of target protein by measuring the sample’s lateral flow distance, specifically looking at an inflammatory biomarker highly associated with heart failure called C-reactive protein. I had no idea what any of this meant when I first started, but that uncertainty is the most important part of FRI.
During my fellowship with the lab this summer I learned all about the past relevant research, potential importance, and mechanisms of what I was working with, and as time went on became more confident with what I could do. It gets frustrating at times because working on a project without knowing what the outcome will be is intimidating, and on top of that you aren’t always sure what you’re looking for. This, though, is what pushed me to become a real researcher, and it will be what pushes you. Sometimes the most important thing you can do is to keep chugging along. It’s also the most rewarding thing ever when you realize you’ve become an expert at something! You may not have a Ph.D. yet, but you get to know your project inside and out, and that’s a truly valuable thing. Having the training to do something at a wet bench on your own or being able to control your computer instead of letting it control you are skills not found in many people our age, and if you market those skills right they can get you somewhere. Because of what I learned in DIY, I was able to pitch myself and my skills to a biotech company in Boston that is taking me on as their first intern this summer. People appreciate experience, so my best advice is to not take for granted what you have done. What you do at UT matters. You have experiences that set you apart that make your story interesting and unique to you. FRI is an opportunity unique to UT, and you’re already forming the right habits by taking advantage of it. This lab is one of my experiences that has taken me very far, made me a better problem solver, and a better scientist overall. I highly recommend coming by during the open house sessions to see what we’re all about- you won’t regret it!